Arviat, Canada, cancels trick-or-treating because of polar bears. The children of one small town in northern Canada are on the front lines of climate change. In Arviat (map), a hamlet of 2,300 people in the Canadian territory of Nunavut, that means no outdoor trick-or-treating this year for the first time. Instead of going door to door, kids in Arviat will instead spend their holiday inside the town’s community hall, which will feature a haunted house, face painting, and plenty of candy. Over the last several years, shore ice has diminished along the western edge of Hudson Bay, forcing the annual polar bear migration closer and closer to town. Bears prefer to be as far out on the ice as possible, to get closer to seals and fish. Less ice means there’s nowhere for the bears to go but straight through town, in many cases. Hudson Bay has warmed by about 3 degrees Celsius—more than three times the global rate—since the 1990s. That means bear-human run-ins have become increasingly common. Arviat is now a town under siege by polar bears. 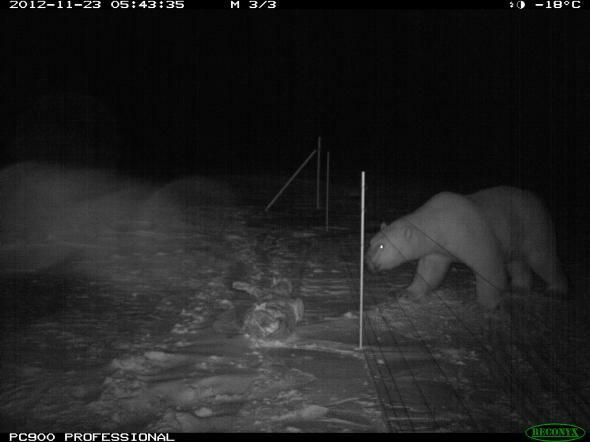 According to an interview with Leo Ikakhik, Arviat’s polar bear monitor, no one has ever been injured by a polar bear there, although one attacked a sled dog last September. Still, a deadly encounter is a very real possibility: “[U]nfortunately, polar bear-human conflicts are very likely going to increase in many parts of the circumpolar Arctic as climate warming progresses,” an expert told BBC Nature in 2011. During peak bear season—October—Ikakhik spots as many as seven or eight bears a day, which is worrisome. The World Wildlife Fund helped support the town’s construction of electric fences around its perimeter and hired Ikakhik, actions that have brought down the rate of self-defense bear kills by freaked-out townspeople. Towns are few and far between in far northern Canada, but the mayor of Churchill, Manitoba—which is about 150 miles south of Arviat and calls itself the “polar bear capital of the world”—has some advice to kids preparing for indoor trick-or-treating: Don’t dress up as a seal.